It is no secret that having children is one of the most fun and stressful times of a parent’s life. Whether it’s your hormones, stress, or poor diet causing your hair to fall out (or you physically pull them out due to frustration), these days there are many solutions to give your hair a helping hand. If you’ve already tried over-the-counter hair fall medications, and they haven’t been effective, there are now phenomenal, non-invasive laser products that can save your hair. We at ParentsNeed have chosen the best laser caps, the best laser combs, and the best laser hair growth devices on the market for review. In this review, we’ll tell you what laser products worked best for hair loss why these choices made our top five favorites for preventing hair loss. The Laser Cap Griva Max Pro272 Hair Regrowth Cap is the best laser capout of the 3 wearable laser hair growth treatments we’ve tried. While the Griva Max Pro272 is one of the pricier wearable laser treatments, we found that the results were noticeable within the first twelve weeks of daily use which is comparably quicker than other treatments. 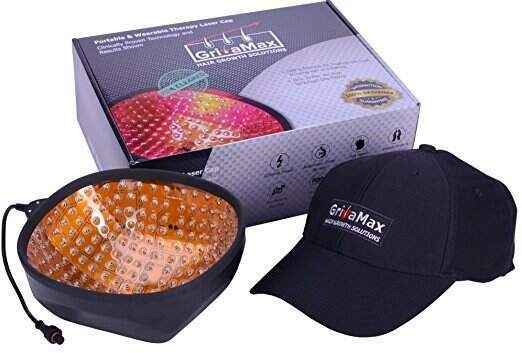 We used the Griva Max Cap for half an hour everyday and by the fifteen-week mark, there was noticeable hair thickening especially around the crown of the head. The battery in the Griva Max Pro272 lasts for one and a half treatments between charges which is relatively more than other models reviewed. We loved that this cap has multiple attachments that allow you to use the laser section by itself or with a discreet cap on top of the lasers to make it look like a normal hat. The Griva Max Pro 272 includes a convenient carrying case that allows you to store and carry your hair growth treatments with you, this ensures that you will stay on top of using this product to see maximum hair growth. While we picked the Griva Max Pro 272 as one of the best laser hair growth devices, wenoticed that after the first 12-weeks of use, you seem to get little additional benefit unless you supplement with other products. We highly recommend using Minoxidilwith this product as results were enhanced markedly with their combined use. Overall, the Griva Max Pro272 was the most impressive of all the products reviewed due to time it took to produce results. Therefore, the Griva Max Pro 272 takes our number one spot. The iRestore laser hair growth system is our second choice for best laser hair growth devices. This hair growth system comes with a six-month money back guarantee where you can return the system for a full refund if you find that your results are not up to par. Not only is the money back guarantee a nice safety net, but we found that results are noticeable after sixteen weeks of 25-minute treatment. The iRestore laser hair growth system has a convenient remote control and is operated hands-free. While it isn’t as discreet as our top pick, the iRestore brings comfort into your laser hair growth treatment. Our testing showed that after the six months, the results this product delivered were excellent, hair growth was noticeable, and the existing hair was noticeably healthier. Hair loss also slowed noticeably before the sixteen-week mark. Hair shine and smoothness was noticeably improved after only a few treatments. The iRestore has comfortable cushioning that keeps the hard parts of the system away from your head without compromising hair growth in the padded areas. One of the drawbacks to using the iRestore laser hair growth system is the fact that the treatment regime requires daily 25 to 30 minutes treatments for 16 weeks, which is longer than our first. 4 months of this daily routine can be quite a chore. This system was also pricier than some of the other treatment systems. Aside from these drawbacks, this system is a super effective hair growth. For these reason, the iRestore Laser Hair Growth slides into second spot of our top picks. Upon testing this product, we noticed that after only three days of use our hair was noticeably shinier and we had less hair fall issues when grooming and shampooing. This product was easy to apply directly to the scalp and lightweight enough to leave in all day without looking greasy. We especially recommend this product for individuals who are suffering from a dry unhealthy scalp as well as hair loss. The Hair Max Prima Laser Comb is an FDA-approved laser therapy hair comb that improves the fullness and restores life into your damaged locks. We selected the Hair Max Prima Comb as our third choice because it is a budget priced comb with semi-professional grade results. While the hair growth isn’t as high quality as our first two choices, it provides the best results we have seen from a hair laser comb in this price range. The lasers in this comb promises to thicken hair and to rejuvenate lifeless locks as well. We loved this light weight and easy-to-use laser therapy comb because we were able to see results after five weeks of regular use in conjunction with Rogaine. For fifteen minutes every morning or evening we used the comb across the entire scalp focusing heavily on hair loss areas. The nine lasers work well to treat each follicle ensuring hair growth is stimulated from all follicles. The beeps and vibrations are a great guide to help you through your fifteen-minute treatment. While this product works well for stimulating hair growth of live follicles, like the other laser hair growh treatment systems, we did not find the Hair Max Prima Comb to be effective on dead hair follicles (follicles that have not produced hairs for 8-12 weeks). We did notice that when using this comb, it would become rather warm towards the end of each fifteen-minute session. The major drawback to this comb is the fact that it is not as convenient as the handsfree laser caps. As it is a comb, it relies on you making specific and slow movements along your scalp to ensure proper coverage, and it takes a few sessions for your arm to get used the required movements. Overall, the HairMax Prima Lasercomb is an effective yet affordable hair loss treatment. While not as convenient as the hands free systems, the affordability factor helps put the HairMax Prima LaserComb into third spot in our top five laser products for hair loss. The Capillus 82 Laser Hair Growth Cap is a discreet laser hair growth cap that is an FDA-cleared treatment to slow the effects of hair loss and to help regrow thinning locks. The Capillus Laser Therapy Cap allows for hand free laser treatment of areas affected by hair loss in only six minutes per day. This is a fantastically short treatment regime when compared with other laser products. However, it seems that this short treatment time resulted in a longer period before seeing results. It took a solid twelve months of treatment to notice an increased fullness. However, the effects of the Capillus Cap on hair health (smoothness and shine) were noticeable after the first couple of sessions. The Capillus 82 Laser Therapy is very discreet and is a cap that you can wear in public without drawing undue attention. We noticed that by the sixteen-week mark less hair was falling out when shampooing and brushing hair than before treatment started. Once we hit around a year of consistent use we noticed thicker hair in areas that previously lacked fullness. Due to the time required to see results, we place it in fourth spot in our top five laser products for hair loss. The Hubee Hair Growth Laser Therapy Comb is the cheapest laser comb treatment that produced noticeable results. Running the comb over your scalp produces a massaging effect and this coupled with the monochromatic lasers stimulate the hair follicles to produce hair regrowth. While the hair regrowth we experienced after several months of treatment was not as significant as that of the our first and second picks, the Hubee Comb does make your hair look shinier and healthier within the first four weeks. To increase the effectiveness of the laser treatment with the Hubee Hair Growth Laser Comb, we using hair growth vitamins, shampoos. During treatment, the Hubee Hair Growth Laser Therapy Comb was noticeably cooler than other laser treatment devices. While the temperature of the device does not influence treatment results, it could affect the longevity of the device so in this regard, the Hubee Hair Growth Laser Therapy Comb comes out on top. One of the major drawbacks to the battery-powered Hubee Hair Growth Comb is that it requires four AAA batteries which aren’t included. From our tests, we found that hair growth was noticeable after seven months of regular use. As with other hair growth laser therapy combs, this treatment is not hands free and you do have to pay attention to combing technique for optimal treatment. Again, we recommend you use hair growth stimulating products in conjunction with this hair comb to see faster results. Overall, if you want laser hair growth treatments for a budget friendly price, the this is a great option. The Hubee Hair Growth Laser Therapy Comb rounds out our list of top 5 best laser products for hair loss. Whatever your reason (or your husband’s) for suffering from hairloss, there are now devices out there that can provide effective treatment. As a parent, looking good will always help you feel better even on long days after sleepless nights. Combining your voluminous hair with your favorite eye shadow palette, can help you be the most radiant mom on the block. No matter how worn out you may feel, p﻿﻿rac﻿﻿ticing self-care is important for your physical and emotional health, which will in turn give you the energy you need to be a better parent. We hope you enjoyed our reviews of laser caps for hair growth and other laser products for hair loss. We hope we were able tohelp you make the best choice for your journey to maintaining the health of your hair.